It’s hard not to feel nostalgic. 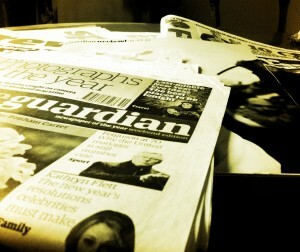 Today, I handed in my final subscription voucher for my copy of The Guardian. I’ve vowed to walk past the station newspaper stand each morning and resist temptation. From tomorrow onwards, I suspect my only regular newspaper reading will be on holiday in far flung, remote places – the Highlands and islands of Scotland, for instance – where 3G coverage is still at best patchy. In this age of the iPhone app, ubiquitous internet access and – perhaps even more importantly – austerity, the newspaper’s days seemed doomed; from a cost alone perspective, my annual news bill of £400+ is no more. My decision to leave The Guardian is not entirely down to technology. Much as I often agree with its political and social outlook, after a while some of its moral, philosophical and theological assumptions start to grate. Perhaps, as self-help books assert at this time of year, a change is as good as anything. Fear not – I am not yet ready for The Daily Mail. Newspapers have been doing their very best to retain readers. Recently, The Guardian has devoted whole page advertisements to its subscription service. The Independent has launched a cut down version – the incredibly handy and informative i – but they seem like the last desperate cries of a slain giant, though at 20p for the i it’s already enough to challenge some of my resolve. Sad to say though, but perhaps the demise of newsprint is for the best. As I write, there’s a pile of newspapers from the last week in the hallway, about to go for recycling. It reaches above my knees. Significantly, the village newsagent from which I bought the paper is (according to local gossip) up for sale. With increased competition and declining sales, the future for such shops looks bleak, and with them goes over a hundred years of daily newspapers. And, yes, I feel a sense of shame that the ending of my small purchase is yet another nail in its coffin.